Can you say 'jersey addict'? Sewaholic's Renfrew transformed me from a jersey novice to a huge fan of the stuff. Ever since, I've kept an eye out for suitable patterns and I'm glad I was able to see past McCall's 6435 dog-ugly cover! I love the sweetheart detail (not so much the 90s asymmetrical look though!) and I can never get enough of comfy tops that can be dressed up or down. This pattern was easy to follow and fast to sew up, but it's no Renfrew. Tasia is the master of construction, ensuring the Renfrew is immaculately finished with arm, hem and neck bands. McCall's 6435 just requires hemming these areas, which doesn't give the smoothest or most professional finish. Next time I'm definitely tempted to draft my own bands a la Renfrew. The neckline definitely doesn't look as finished as the Renfrew and it's a bit wide for my frame too - will have to alter it next time. It also looks like the sleeves are pulling a little in these pics, though they don't feel tight at all! Still, I do like how this top looks good worn tucked in or out! 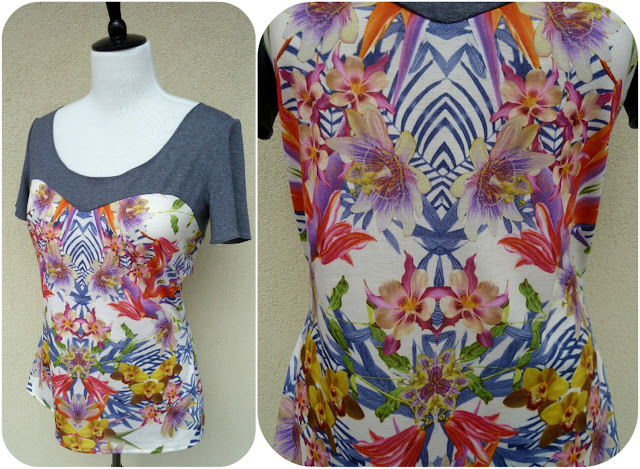 I couldn't decide whether this crazy, tropical flower print was tacky or cool - I love it either way! So why does making a harmless little top make me a jersey addict, you ask? I blame Clare wholeheartedly! She suggested I check out a particular stall at Leicester market on a particular day...and OMG! The stall itself is a disaster zone, but boy does the man have jersey. So much jersey...all piled up into a jersey mountain and you have to really dig for the gems. But there are gems...so many gems! I ended up leaving with too many metres (in the double figures), but with it working out to just £1 p/m, who was I to resist?!? I love these busy prints - the first Aztec-inspired one is crying out to become a maxi dress...oh yes! Cannot resist sweet floral prints - don't you think the second one down has a bit of a 50s look to it? 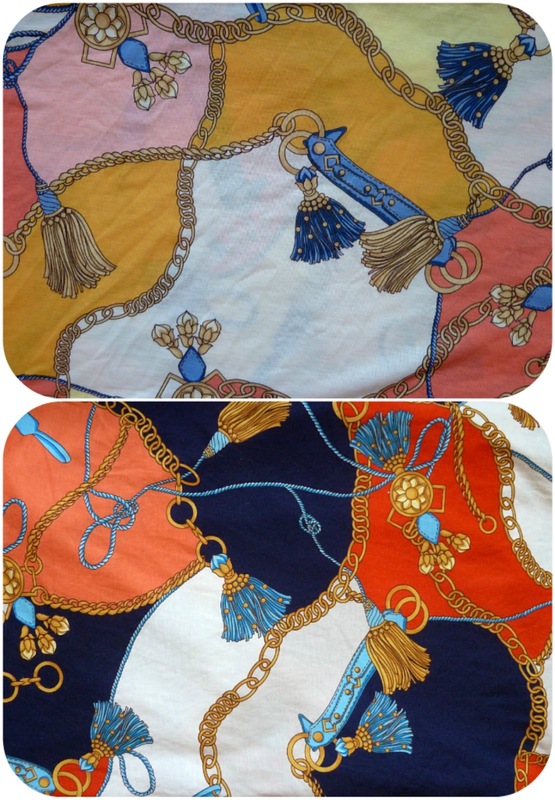 And possibly my favourite of the bunch - the very Parisian, scarf print jersey! Coincidentally, I walked into New Look on a whim today and saw the bodycon dress on the left. It's made in exactly the same jersey as mine and it's also available in the lighter print too. Does this mean I have famous fabric? Erm, so yes...do you think this makes me a jersey addict? I don't really think I can live in denial any more, do you? I think your new top is absolutely frigging AWESOME! Will you wear it tomorrow? Purl ease! Thanks Karen! I hope you weren't too dissapointed that I wore my floral Renfrew instead...? Ooo, I love this top! I'll be snatching up that pattern when next it goes on sale. Good eye! What great new fabrics too. I especially love the "famous" one. It really is hideous cover isn't it!?! So glad I looked past it, usually I'm not able to! Lovely fabric- I'm looking forward to becoming a stretch addict too. Thanks to your OWOP I have now purchased the Sewaholic pattern. Addict - no, but you definitely caught the bug. LOL. I started out sewing exclusively with knit fabrics, since it lowered the need for FBAs. LOL. I feel I've 'regressed' in sewing skills as you can be quite lazy with jersey...but I make no apologies...hehe! Marie, these is fab.. I need to steal some of your lovely tops ! Thank you! It was so good to meet you today! Eek! I want all this jersey! So cute! I like the bright tropical print! 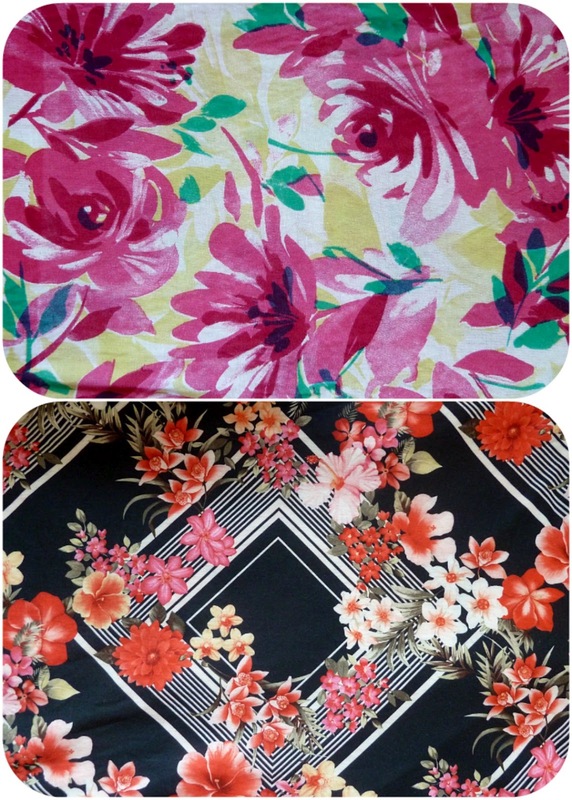 I love the scarf print jersey - can't wait to see what you make out of it! And I love the new top - the colour combos are fantastic. Thanks! 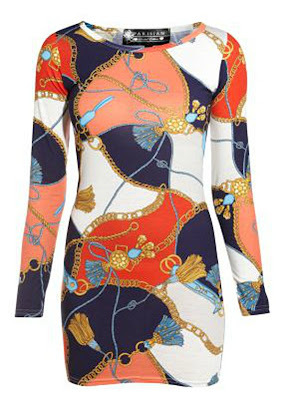 I have a dress in mind for the scarf print jersey...I love it so much! Love that Parisian scarf print. Where did you get it? I think the contrast sweetheart neckline on your tshirt deletes any potential for tackiness. I got it from a stall on Leicester market Gail...it's just brilliant! As addictions go, this is a fairly lovely one! And your creations are so excellent, it's not a problem, it's a solution! Haha, thank you! I like your way of thinking! I love your top so much! That style is lovely and it is great to be able to see past ugly illustrations, something I struggle with. I totally love the fabric you used, it is not tacky at all, I think it is bright and funky. These are really cool prints. Lol! This is great. You're really making me want to try my hand a jersey. I love the prints you picked. That stall sounded so fabulous! OMG Is there anything more exciting than fabric bins where you have to dig for the gems? The best kind of thrill! Where did you find the pattern, by the way? Oh, and could you drop me a line at AllStyleAndAllSubstance@gmail.com -- I have something to ask you in private message and could not find your contact info here!! Next up you will have to buy a coverstitch machine Marie! They make excellent double stitched hems on jersey knits.you have some cute everyday tops now! Loved you Renfrews too! Oh no, don't tempt me with more equipment!! But it would be great to get the 'Renfrew finish' on all my knits!!! Nowt wrong with being a Jersey Addict, especially when you look so good in them!! I think I am Cotton Caffy TBH.... just love the stuff, but then again... who doesnt?! Oh I'm behind on so many posts! I'm so glad you found the jersey man - that stall is one crazed heap of fabric but some really fantastic bargains. It's about time for my annual rummage so maybe see you down there ;-)! Think I need some of that Aztec print in my life. Thank you for the sunshine award too although at my rate of posting / participation, I'm not sure I deserve it!! Clare, I thank you and curse you at the same time ;o) I definitely need to limit my trips to that stall to just one annual one for sure! That top is very cute! I run into the same problem with necklines on t-shirt patterns being to wide for my frame. Another thing I've found with patterns for knits is that they often have more ease than I'd like, meaning they have to be taken in an inch or more, usually. I think I've yet to come across a pattern for knits I haven't had to alter in some way. Oh well, what's new! Oh, and there's no shame in being a jersey addict! 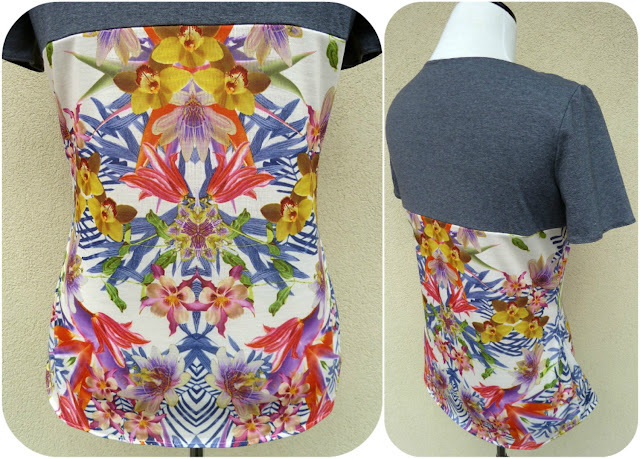 It is a comfortable material that is really fun to sew with, and it makes flattering outfits. Oooh, I look forward to seeing what you make! I love your version of that top! I'm useless at trying to see beyond a dodgy front cover illustration on a pattern so I'm well impressed with what you've made from that! Believe me, it was so hard to see past that cover! Completely in love with the Aztec prints! Fabulous. Those prints are out of this world!!!! Neeeeeeeed to get my hands on some aztec jersey metreage (is that even a word...?)! If you ever come to London with space to spare in your bag, I got the money if you fancy being my jersey dealer!! Sorry for the necro-thread, but my sister any I have been trying to remember which day of the week the jersey man is there... please share? Hi - the Other Clare here! He's usually there on Monday, Tuesday and Thursday. He often disappears for long stretches during the day which can be frustrating. I've found that early morning is a good time to catch him but he usually packs up around 3.